Does anyone know of a source for this pattern, or at least for the sleepy puppy appliqué, or one similar? 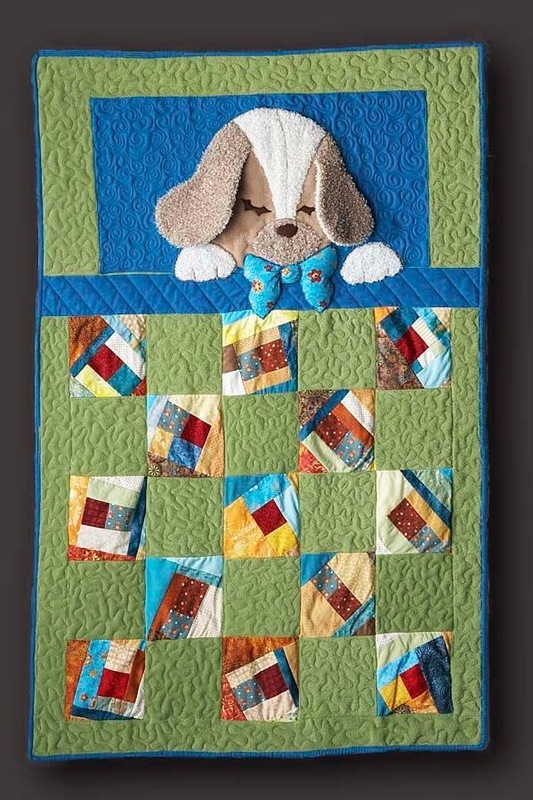 I would love to make a similar quilt for a dog loving young friend. Thank you in advance. No, I do not, but it is soo cute! Hope someone can help you on this site. awwwwwwww .... he is just so adorable! The loose floppy ears and the soft fabric just makes him ever-so lovable! You could probably make your own pattern ..... sketch off what you have there, and blow it up. I do believe that’s it. Thank you so much! All I know is it is darling. I think this one is cuter than the one in the pattern! That's just too stinking cute! I have a similar pattern made with 2 teddy bears (1 awake & 1 sleeping) I have made these for about 30 years. When the new mother has a different animal theme I just use a picture from a child's coloring book and enlarge it to the size I need. You can use any size block for the quilt area. Good luck. I just love this adorable quilt. Did you find the pattern? If you read through the thread, you will see that it has been found! How about Buying a stuffed animal you like and "behead" it and unstuff the head and applique it on a block?